Screen shot. 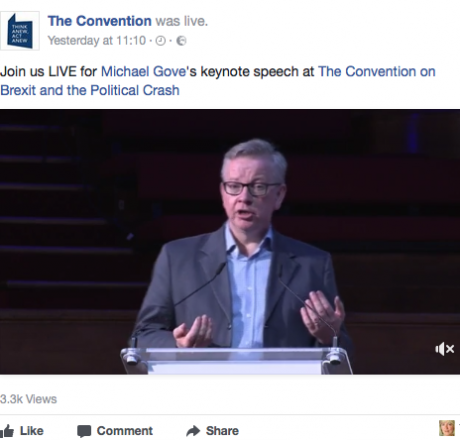 Michael Gove at The Convention, May 13, 2017.Good morning. It’s a huge pleasure to be here and I want to begin by thanking Henry Porter, The Observer and openDemocracy for organising this conversation. Whatever one thinks of Brexit, it is undeniably the case that it has reinvigorated democratic debate in this country. Participation in membership of all our political parties has risen, and events like this which are occurring across the country are a healthy part of making sure that our future destiny is decided by public conversation and debate. Whatever one thinks of Brexit, it is undeniably the case that it has reinvigorated democratic debate in this country. I want to associate myself perhaps for the first time but I hope not for the last, with a point made by Jolyon Maugham earlier, which is that wherever we come from on the political spectrum we all benefit from hearing a different and divergent point of view, even if it is only to reinforce the passion with which we held our first view. But one thing I want to ask in this audience, is for a little bit of help and audience participation. Now some of you I know were too young to vote in the referendum. Others of you for whatever reason may not have been able to vote. But all those of you who did vote and voted to remain, can I invite you to put your hands up please? Good, thank you. All those of you who voted in the referendum, and voted to leave, could I invite you to put your hands up please? (rather less raise their hands). Well, to follow up what Jolyon said earlier, I may be in Methodist Central Hall, Westminster, and I may be about to preach, but it is not to the converted. I’m a big bad Brexiteer. Worse than that, in front of an audience composed of many Observer readers, I am a Murdoch employee. 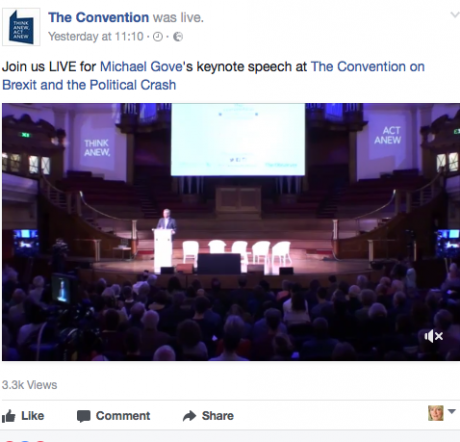 Worse than that, I was a member of the Cameron Government that brought you the Great Moving Out of Europe Show that was the referendum. So in speaking to you today, I am aware that I am likely to be as out of step with the majority of you as an Orangeman in the Vatican at a Papal Mass. Thank you. I think there were also people who voted to remain because they thought that the unity of our kingdom might be threatened by being outside the European Union and they valued the strength that comes from all four constituent parts of the United Kingdom being together. I think that noble attachment to the unity of the kingdom, that belief in democracy, that belief that international collaboration is a good thing – they are all noble aspirations. So why did I argue that we should leave? It is all about democracy. Well actually, one of the questioners before I came on put their finger on it. It is all about democracy. If we look at the history of the European Union, in its earlier stages the European Union was integral in establishing democracy in authoritarian states like Spain and Portugal and Greece after the colonels. It was also instrumental in making sure that democracy took root in the countries of eastern Europe after they escaped from the tyranny of communism. But, my contention and fear is that the democracy which took root in those countries was not replicated in the institutions that governed Europe, and in particular, was not replicated in the way in which the single currency was managed and the economic policies that flowed from it were implemented. And if anyone wants to know from a completely different but utterly honest perspective about the damage that the single currency and European integration wrought, I can do no better than recommend that you read Yanis Varoufakis' latest book of memoirs.I can do no better than recommend that you read Yanis Varoufakis’ latest book of memoirs. In it he explains – someone who in his heart is a European, and who never wanted Greece to leave the single currency – he explains the evasion of responsibility on the part of Europe’s élites when his country, the home of democracy, was suffering as a result of an unfair economic policy that imposed austerity on the poorest and resulted in a backlash which saw for the first time since 1945, Nazis in the Greek Parliament. One of the problems with the European Union is that those at the top, pace A.C.Grayling’s defence, are not democratically elected or accountable. The individuals who are responsible for the management of the single currency or for the adoption of Schengen, are not people whom any of us ever elected or whom we could ever throw out. And that means that the European Union has a danger of becoming either corrupt or complacent, because it is not accountable to the people. And the truth about our democracy, which of course developed in Greece, grew in western Europe and has now taken flower across the globe is that democracy succeeds because you can transfer power peacefully through the exercise of a vote at a ballot box. If we look at the history of democracy, democracy has generally, not always, been fostered and flowered within liberal nation states. So if one looks at the experience of the United Provinces, the Dutch Republic when it seceded from Catholic Hapsburg Europe, if once looks at the experience of Britain in the seventeenth century when we rejected the ancien régime, if you look at the experience of America in the eighteenth century when it got out from underneath the british Empire of that time, in each of those occasions, free citizens said, “We want to govern ourselves. We may be part of a larger unit, which offers us prosperity and promises to shield us from the chill winds outside, but we would rather take control of our elected representatives, give them instructions, and when they get things wrong, change them.” ( Hear, hear and scattered applause) The individuals who are responsible for the management of the single currency… are not people whom any of us ever elected or whom we could ever throw out. And it’s been that principle, that principle of democratic accountability which has powered progress throughout the ages. The United Provinces in the time of the sixteenth century was the home of free thinking when the Catholic Hapsburg Europe was the home of reaction. Britain, in the seventeenth century, through the example not just of the original parliamentarians, but also those who overthrew James II, Britain became the home and a beacon for liberty at that time. America – it’s important that we remember it at this difficult time – America in the eighteenth century made the principles of representative democracy alive and exciting and resonant. And the vote to leave the European Union may have been driven by many factors amongst many people, but for me it was primarily about making sure that whoever is in Number Ten, Downing Street, whoever exercises power over you is someone that you can throw out. Because one of our problems with being in the European Union was that there are all sorts of laws, whether it is VAT on tampons or where we build our houses, that were decided by European regulations and directives that we in parliament couldn’t reject and couldn’t even amend. There are legitimate concerns that are sometimes raised about the way in which the Executive steam-rollers things through the House of Commons. Absolutely right they should be raised. But one of the most effective ways in which any Executive can steam-roller things through the House of Commons is to have it agreed at the European level, in councils which are not transparent where minutes are not recorded, where people are not held accountable, and if it is agreed at the European level, those people who like me are currently running for election and who can be thrown out of office if we get things wrong – we could not influence it. And that’s why, having explained I hope, some of the reasons why I voted as I did, I want to end by issuing an appeal. There will be many people here who will deeply regret the decision that was made and want to revisit it. And as we heard in the debate on the second referendum, arguments will be run about what new forms of democratic legitimacy may be required at some point in the future for the course the Prime Minister wants to take us on. I don’t want to get involved in that debate unless you want to ask me about it. I have clear views but I don’t want to trouble you with them here. What I want to do is to issue an invitation about something else. For me it was primarily about making sure that whoever is in Number Ten, Downing Street, whoever exercises power over you is someone that you can throw out. It is overwhelmingly likely – the vote is clear – that Britain will leave the European Union, and as a result of leaving the European Union there will be choices for all of us to make. Do we want to keep the current system of agricultural subsidy that we have under the ‘common agricultural policy’? I don’t think we do, because I don’t think it either safeguards our environment, ensures that we have biodiversity or provides appropriate income support for the very poorest small farmers. So what are we going to do in order to have the right environmental policy and the right agricultural policy? Similarly when we are outside the European Union we will be outside that ‘common security and foreign policy’, but Britain will still have armed forces, a seat on the UN Security Council. We will still be spending, and I think it is right, 0.7% of our GDP international development – so how are we going to exercise our global power? Some of you might say it will be diminished, well I disagree. But we are still going to be a significant player in hard and soft power terms, so what are we going to do? Which values are going to prevail in that debate. Similarly when it comes to the migration policy that we will have, we will no longer have the migration policy that we had in the European Union which favours EU citizens over others, so how do we want to shape that migration policy? And the invitation I want to make to you is that if you feel, “Well, you Brexit, you own it – you Brexiteers, it’s your problem.” That ‘s fine! But what you may find is that the solutions that come about as a result of that don’t reflect Britain in all its diversity, in all its raucous pluralism, in all its breadth. There are legitimate concerns that are sometimes raised about the way in which the Executive steam-rollers things through the House of Commons. So the invitation which I issue which is a genuine one, is – I don’t want to shift anyone from their allegiance. I hope people will embrace the opportunities that Brexit brings but I recognise that I myself have strong political feelings and convictions: they don’t change overnight. People’s convictions here will not change overnight. But I do hope, as we develop new politics in this country, whether you are conservative or liberal, whether you voted remain or leave, that you will play a part in shaping a Britain outside the European Union that reflects the best of our past – open, liberal, tolerant, pluralist – but also can act as a model for the future, a strong partner for the European Union, standing up for progress globally, extending free trade, and making sure that democratic values, which I know that everyone here by their very presence believes in are at the heart of our future. Thank you very much.